Trekking to the Bertol hut. Having lived, hiked, climbed and traveled in the Alps since the early 1980s, the nearly endless opportunities for exploration and discovery in this amazing mountain range seem only to expand the closer we look! The Alps are truly unique in the world. A vast range, with enormous climatic, geological and ecological diversity, its human and cultural environment is equally fascinating. Every high alpine valley has its own community, cuisine, style of living, festivities, even it's own dialect in some cases. One could literally spend a lifetime exploring and still find something new around every corner. The modern alpine infrastructure of lifts, trains, huts and high villages mean that you can enjoy the contrast of a demanding trek through a high and wild mountain world, and still bask in the creature comforts of a fine meal and comfortable bed at the end of every challenging day. Our trekking programs are designed to introduce you to this unique world, and to pave the way for personal discovery. Our itineraries combine physical challenge with strategic use of comforts and conveniences, to maximize the joy of exploration. We also enjoy running custom programs for groups of friends or families. Contact us if you would like us to work with you to design your own private trek. In a new direction, Kathy will offer a cultural tour in the Hautes Alpes region near Briançon in June. This tour focuses on pastoralism and combines light hiking in the Queyras mountains, with workshops in such fiber arts as felting, vegetable dyeing, and hand spinning, led by some new friends she has made near Serre Chevalier. 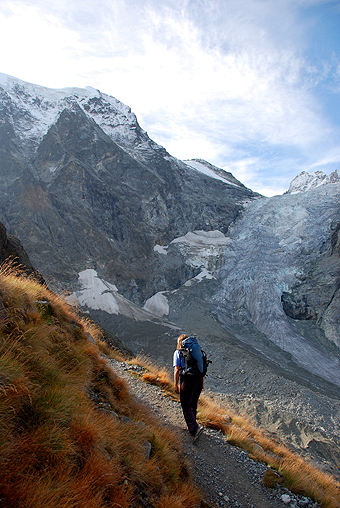 This is a classic Swiss trek through quintessentially "Swiss" countryside. We offer the 6-day trekking program and also a 3-day add-on to climb the glaciated, but technically straightforward Wildstrubel. This trek is somewhat more demanding than the Walker's Haute Route, but easier than the Haute Route Glacier Trek. This demanding and strenuous route crosses glaciers and high passes, requiring the use of ropes, crampons, and ice axes. Most travel is off-trail, or on trails that are not well marked or maintained. Most nights are spent in mountain huts, with limited facilities and no dedicated vehicle support. A trek though the most glaciated mountains of Europe. This 7-day trip crosses large glaciers every day in the heart of the Berner Oberland. All nights are in high and remote alpine huts. If weather and conditions permit, we also have the option for a couple peak ascents. This multi-day trek avoids glaciers and the highest passes, but takes in high rugged terrain on trails of varying quality and difficulty. We stay in hotels or inns most nights. For experienced hikers with a very good level of fitness. We can offer either of the above treks, or others as desired, as a private program for just you and your group. Please see the pages above and/or contact us for more information and pricing. Strenuousness - Some treks have longer days than others, with more uphill climbing or walking. 3 is the hardest, 1 the least hard. 2 - may denote a combination of the two, or a hut-based trek with particularly well-appointed huts! Technical difficulty- Some treks require occasional use of technical mountaineering equipment: ropes, harnesses, helmets, crampons or ice axes. If prior experience with the use of this equipment is required for a trek, we indicate that in our description of the program; otherwise these skills will be reviewed during the program and/or can be picked up along the way. the original summer "High Level Route" pioneered in the 1860s by members of the Alpine Club of Britain, which travels largely on glaciers and crosses many high alpine passes. This is what we offer as our Haute Route Glacier Trek. the "Walkers' Haute Route" which follows mostly marked trails and avoids glaciers and the highest passes. the Skiers' Haute Route done on touring skis in March and April. Trekkers on the Chamonix to Zermatt Haute Route Glacier Trek.